A lite and fast dwg viewer, browse, view, measure, print DWG, DXF, DWF files. Supports AutoCAD drawing format from R2.5 to the latest version 2012. 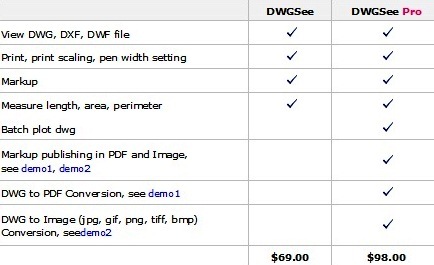 DWGSee DWG Viewer Pro version supports DWG to Image (jpg, tiff, gif ), dwg to pdf conversion, it also supports advanced markup, let you publish markup in PDF or Image format. Supports AutoCAD 2012 Now! DWG Compare is a feature of DWGSee - It helps you find differences between versions of AutoCAD drawings and display them graphically. Find differences between two revisions of an AutoCAD drawing. Display the differences in views, using contrasting colors for added entities, deleted entities and modified entities. Synchronously zoom the result drawings. Synchronously locate the selected entity when you click the result report list. Comparison of the contents of configuration. How to run AutoDWG DWG Compare? Download and launch AutoDWG DWGSee Pro program, from menu bar click "File/DWG Compare", and then please select 2 reversions of one drawing file to compare. 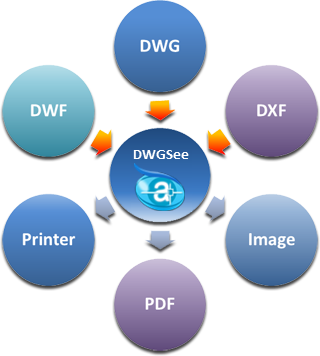 What's difference between DWGSee and DWGSee Pro?